Should I have my hernia fixed if I have no symptoms? Can my hernia be fixed with laparoscopic “key hole” surgery? A Hernia is a protrusion of a viscus (internal organs including fat in the main cavity of the abdomen) through a defect. Most often this can either be a visual or palpable lump in the groin or abdomen. Occasionally this can just present with pain but no visual lump. The lump can often be pushed back in and reappears after manual labour or on standing. The natural progression of a hernia is to get bigger with time. Repairing this while it’s small is technically easier and reduces the operative risk and complication rate to you. There is the added risk of your hernia potentially becoming incarcerated (stuck) casing significant pain or even strangulated which is loss of blood supply to the hernia content (in certain cases can result in dead bowel). Patients can also get bowel obstructions because of their hernias. Can my hernia be fixed with laparoscopic ‘key hole’ surgery? 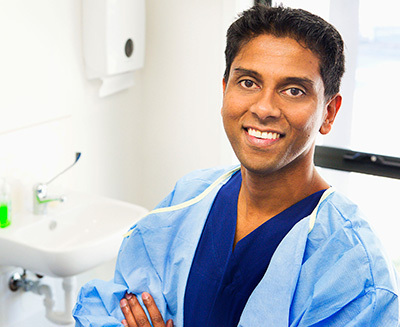 Dr. Niruben specialises in minimally invasive or ‘key hole’ surgery for hernia repairs. In most instances he personally advocates for patients to have ‘key hole’ surgery, especially patients with groin hernias. There has been sufficient published data to support patients having groin hernias repaired laparoscopically returning to work in a shorter time frame with less associated chronic pain than those who undergo an open operation. In patients who have had previous open groin hernia surgery, laparoscopic or ‘key hole’ surgery is a very real possibility in treating this hernia. This ‘key hole’ surgery can be utilised for most hernias, however there are certain situations in which this would not be suitable. Patients who can’t tolerate a general anaesthetic will not be able to have a laparoscopic / ‘key hole’ operation. In most cases these patients can still have their hernia repaired under local anaesthetic. Patient with previous open surgery such as laparotomy or open prostatectomy. This needs to be discussed in a personal consultation with your specialist. If you do have a hernia you should seek a specialist appointment to discuss your individual risks and circumstances. Hernia surgery is a common procedure, yet it can be challenging. Dr. Niruben has specialised in treating this condition with laparoscopic or ‘key hole’ surgery both in patients with a new hernia as well as patients who have had their hernia operation elsewhere.